The nomads Crooked knife serves as the wilderness travelers draw knife, and plane. Not so long ago, wilderness living dictated that people needed to know how to make what they needed from the land. Chief among these items in the wilderness northwest of Lake Superior, were canoes, paddles, snowshoes, and toboggans for these were the tools one needed to travel the land hunting, fishing, gathering and moving between seasonal use areas. People also needed to be able to make baskets, clothing, shelter, traps, fishnets, wild ricing poles and knockers to name a few things. Steel axes, and crooked knives forged in the indian's camp fire were the principal tools with which nomadic hunters and voyaguers alike fashioned the crafts that made life in the wilderness possible. We teach traditional hand crafts are at our island homestead to individuals, and small groups. We also, incorporate handcrafts into our wilderness experiences when ever possible. These projects often start with a walk in the woods to locate a suitable tree to fell and turn into the raw materials that will be split, hewed, and carved into a functional wilderness implement. 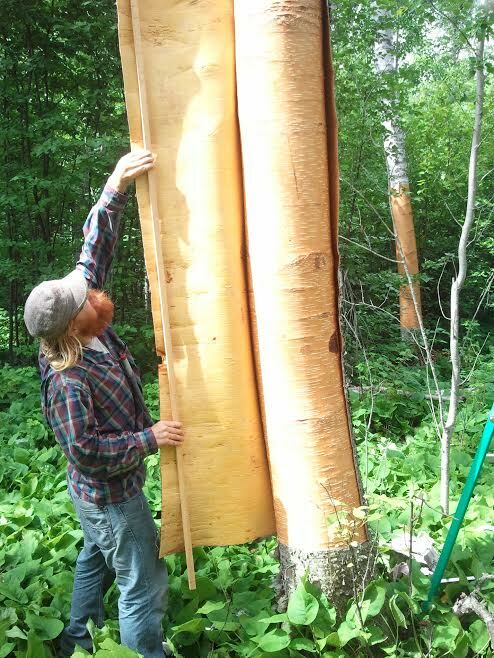 Taking simple tools into the woods and using them to transform the woods resources into a necessary, high-functioning piece of equipment while surrounded by the great northwoods is a truly transformative and empowering experience. It engenders a deep sense of self reliance and connection to the land many have never felt. If you follow this experience by putting your new paddle, snowshoes, packbasket etc. into use on a wilderness trek with us or in your own travels your appreciation for that implement, the land, your hands, and the ingenuity of the people of the past grows with each stroke of your paddle, or step of your snowshoe. I recommend every wilderness enthusiast treat themselves to the big medicine that comes from making their own gear, in the old way, with their own two hands, surrounded by the landscapes they love. Traditional handcraft and the traditional knowledge that accompanies it puts the power in the hands of the maker, and puts them in a position to only take from consumer society that which is necessary and that they can not, or unwilling to make for themselves. Craft's you can learn from us include-Paddle Carving, Snowshoes, Birch Bark Canoes, cree hunters shovel, Tump Lines, Black Ash Pack Baskets, birch bark crafts: knife sheaths, baskets, containers and ornaments- mukluks, mittens, wild rice knockers and push poles, kooksa, crooked knife construction, as well as traditional log and timber frame work as projects develop. If you would like to come stay with us, and work on your handcrafting skills, please email us for scheduling considerations.